In my time, I have been a fan of drivers and a fan of F1 teams. At one time, I was even an enthusiastic supporter of one of the designers, Gordon Murray of Brabham fame. But, like Patrick, of Motorsport Ramblings, I thought I was over all that and could now enjoy the sport purely for its own sake, without the need for partisanship (apart from my dislike of Ferrari, of course). That was until I noticed Dr Mario Theissen, the boss of BMW's F1 effort. The more I study the guy and his public pronouncements, the more I think that he's a winner. There he is, the architect of a team that has done more each year than its stated goals, a team that is now recognized to be seriously threatening the big two, and still he keeps a cool head, refusing to set targets beyond what his team can realistically achieve. The man does not dream - he makes things happen! Take his most recent assessment of his young star driver, Robert Kubica. No, no, says Theissen, he has no illusions that Robert is a genuine challenger for the championship this year. That must wait until 2009, he says. Yet he is speaking of a driver who is only six points behind the lead and who is expected to win at least one race this year. We all know that Kubica could be the one to benefit from McLaren's refusal to adopt a lead driver strategy and Felipe Massa's continuing battle for head honcho status with Kimi Raikkonen. It would not be the first time that a driver wins the championship after winning only one or two races, while others in better cars take points from each other. So is Dr Mario really that pessimistic or is he keeping the lid on any unrealistic dreams amongst the team members? I think it is just very clever strategy on his part. He is human and must sometimes think that perhaps they can do the trick this year, ahead of the schedule he has set. But he knows that much depends on the performance of the other drivers and teams and, perhaps, even more depends on luck. There is no reason for him to start bragging - that time will come if Robert manages to sneak the trophy after all. Ron Dennis has already revealed his opinion that BMW will not be able to keep up with the leaders' pace of development. I can imagine the good doctor's reaction on hearing that: "Excellent, Ron, you keep on believing that." Dr Mario will even encourage such thoughts in the opposition by expressing his own certainty that this is not BMW's year. It does not affect the reality of the situation, even if BMW have some clever developments on the way; it lulls his competition into complacency and lets his team concentrate on their task, rather than getting over excited. What has he got to lose, after all? If BMW come third in the manufacturers' race and Robert finishes third or fourth, they have done exactly as he has predicted. 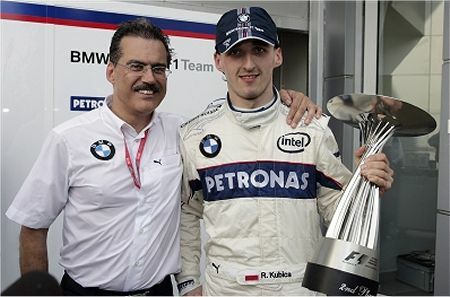 But, let Kubica win the championship and he can be pleasantly surprised and the hero of the moment. He's a clever man, that Dr Theissen. I still think that BMW have a few surprises up their sleeve and that they will win at least one race this year. And a factor in my certainty is Dr Theissen's record of exceeding his targets year by year. As his comments on the Mosley fiasco indicate, he is a racing man and just wants to get back to racing without all the political nonsense. That puts him in the same mold as Sir Frank Williams and we know how many championships he has won. It all means that I find myself once more rooting for one team more than any other. Which is strange, really, as I have little time for BMW as a car manufacturer (solid, German, undeniably good cars but a little common, wouldn't you say?). In the end it comes down to my admiration for the good doctor and the excellent team he has built. They call him Super Mario and I think that's an understatement. I think Mario is doing wonders at BMW and when you look at how far they've come in only two and bit years it is very impressive. However, I don't think it is entirely down to Theissen: he sets the goals, but it is the team as a whole that is exceeding them at the moment. I liked BMW, not the way you do, but because they seems to be a real racing team, as McLaren, the team that I support. I didn’t feel that Toyota, for example, have the same racing spirit. Coincidently you put Sir Frank at the same level than “SuperMario”, and I think that little fight between them some years ago wasn’t a good moment for both of them. I read Patrick´s post and I must to admit that I always accuse some friends to support Ferrari just because of the color´s car. They answer me: “I support Ferrari because of the tradition!” So what? I must confess that I cannot see why anyone thinks that Kubica will win a straight race this season. By that I mean a race that is not affected by weather, accident or the dreaded FIA politics. This season is unusual in recent F1 history for the number of drivers from the two leading teams who have taken themselves out of contention for race wins or podium places. Massa famously dropped the car twice, Heikki has struggled to get good results at some races although I have no doubt it will all click for him soon and he will be right up at the front. Even Kimi and Lewis have had days to forget. Yet Kubica has not won a race. Monaco is a prime example Kimi and Heikki never threatened the podium, Lewis put his car in the wall and Massa went down an escape road. All four drivers in the lead teams did things that normally would have taken them out of contention for a win yet even in those conditions Kubica could not win. If he cannot win with all four drivers in the top two teams hitting major problems how on earth is he going to win a straight race? His car was good at Monaco so it is not like the race was at a circuit that did not suit it. Please note this is not a criticism of the driver it is simply that his car was nowhere near good enough to win even if he was in a comfortable podium position. Ollie: Certainly, it's the team - but the man who makes the team function is an important aspect, I think. Look at Red Bull, who have plenty of famous talent in their team but are taking much longer than BMW to make any impression on the leaders. And then consider the difference Todt made at Ferrari - sure, he had help, but he had to hire that help and then get it to work together. The Doc may not be all of BMW's secret but he must be an essential ingredient! Becken: "Biased and passionate" - I love it! Guilty on both counts, I fear. Steven: Circumstances, I think, the Monaco race. Everyone agrees that Hamilton won because he brushed the wall and had to pit when he did. Not having watched it on VisionF1 yet, I'm still not sure how that worked out but I accept that it did - the evidence was Lewis on the top step of the podium! Kubica beat Massa after getting past him when he slid briefly off the track - and he stayed in front of him, even adding to his lead. It was just the timing of Kubica's stops that allowed Hamilton past. So I feel quite justified in saying that Kubica was the best driver out there that day, since he made no mistakes, and it was only circumstances that took away the win. I have to confess I never much cared for Thiessen when he was busy interfering with Williams, but he has done a remarkable job of turning around the old Sauber team. Perhaps Frank and Patrick should have listened to him a little more. Theissen and Frank Williams (and Patrick Head) was probably a bad mix, I think - too much alike and all with very sure ideas of how to proceed. Sometimes collaborations are better after they split! I have been very impressed with the good doctors quiet efforts over the last couple of years. And I always look forward to anyone - heck even Toyota would do - who can break the McLaren/Ferrari stranglehold on the sport. I do beleive that Kubica will win a race this season, he is a true 'racer' and I guess it just seems unfathomable that all the cards will not fall in his favour at least once this year - even though I admit the car needs a bit more work before victories are a sure thing. And on a personal note (I know, I always chime in with one of those ;)) Dr Theissen absolutely cracked us up at the OzGP. He was signing autographs and was at one end of the fence, and Taku was at the other, signing his. They met up in the middle, and Theissen got his texta, and autographed Taku's shirt for him ! It was hilarious. Who says the Germans don't have a sense of humour? Great anecdote, Peril - it's always good to see the more human side to the personalities in F1. And yes, I admit that one more reason for my support of BMW is that we need the Ferrari/McLaren stranglehold to be broken and BMW are the most likely! well, i share the wish for kubica coaxing the title out from under everyone else's-dare i say it? -nose. i don't like to make comparisons between drivers, really but he sort of reminds me of mika-at least in the determination area. which may be part of the reason he's outpacing heidfeld right now. and from reading some of his background he is one tough racer, physically and mentally. hopefully heidfeld comes onto game. i really was looking forward to some real one up-manship volleying between them. and i'll take the challenge. i've always preferred bimmers to benzes. but maybe that's just nostalgia for the old tii-or the 320 in the rain. no matter what benz i've driven i feel like i'm heading up the column. and hey, i am strictly working class anyway so common suits me. I think Heidfeld genuinely has a problem warming the tyres quickly enough - and that really counts against him in qualfying. Dr Theissen says they're going to be working hard on that with Nick so, hopefully, we'll see an improvement in the next few races. The only problem is that moustache. I mean, have a shave mate. I think this qualifies as a well timed article. It happens to me often, Steve - I write an article and then reality comes dutifully to order in the next few days. Which gives me a problem of what to write after the event! Ali, I'm as chuffed as a brush, as they say. I'm writing my thoughts on the race right at this moment and the picture in my mind is always the three BMW guys on the podium, Robert obviously delighted, the great grin on Dr Mario's face as he accepted the constructor's trophy, and Nick as quiet as ever, accustomed to being forever second, but glad for the team no doubt. They are a great team.